Last month, we ran our first evacuation from the oil rig. This was built around a scenario written by Dr Andrew Shepherd (AKA Dr Darcy Mint and Mr Quentin Harcourt). Following a short briefing in the Media Zoo boat house, the ACME consultants – now identified by their blue safety helmets – were ferried out to the platform in one of the numerous motorboats. They were given a full tour of the platform by Johnson and Aallyah. The consultants were then required to familiarise themselves with the platform, and several days later present to Dr Darcy, Mr Harcourt and everyone else on specific aspects of H&S. This presentation was done on the helipad using slides uploaded by Johnson. Both Aallyah and Johnson were very pleased to see that all smoking cigarettes and booze bottles had been identified! In addition to H&S, the consultants were asked to include a suitable evacuation plan. The platform supervisor, Mr Harcourt, a misery at the best of times, assigned the consultants certain tasks around the rig. It was at this stage that Dr Kelly Barklamb (AKA Doreen Mint) put in a performance worthy of Oscar recognition, as she played to perfection the distracting and obstropolous administrator unwilling to do anything the consultants asked of her. While all this was going on, Johnson flitted around the rig laying fires, before setting off the first klaxon and starting the evacuation. Although one stairwell was blocked off, eventually all the consultants made it to the waiting boats and headed for the shore. No lives were lost! All participants acknowledged the realism of the evacuation, made more so by the noise of the klaxons. The scenario will become more refined the more we run it. But for a first attempt, we were overall very pleased with the way it went. And certainly the participants/students/avatars/consultants tell us they found it very useful. The adapting of the DUCKLING oil rig to Kelly’s and her colleague’s requirements is going well, and SWIFT’s genetics lab is taking shape nicely. Recent visitors to the Alliance have been reassuringly complimentary about the simple and effective pedagogy behind both. I also saw several excellent Second Life papers at ALT-C in Manchester last month. Luke Woodham has been designing some great virtual patients for health professionals to practise on, while the wonderfully quirky Lego Mindstorms have been used by Michael Vallance to allow constructive collaboration in robot design between students in Japan and Hull. Both seem to be simple and effective uses of Second Life. I accept that I’m fairly new to this educational tool, and almost certainly have much to learn still (I expect I’m too positive about Second Life), but I was nevertheless intrigued to read the recent blog by Alan Cann, a University of Leicester colleague. Reading the posted comments and those on the FOTE09 panel page, Alan clearly has triggered a passionate debate and I think probably makes one or two good points. But I disagree with most of what he says. For me, Second Life is a stable environment (certainly as stable as any other technology we use) that is intuitive and easy to use. It is cheap (our oil rig was given free by Sky Maruti), open to anyone and learning to build doesn’t take long. It offers an immersive, collaborative place for learning to take place. Most of all, though, it offers the potential for innovative learning. This innovation is probably beyond me – at present – to devise, yet I would be very reluctant to dismiss Second Life for my failings as a learning designer. I’m sure other virtual environments do the same thing, and perhaps even better, but right now Second Life is fit for purpose, even with the tightening up by Linden Labs on its trademark. There may come a time to move to another virtual world such as OpenSim, but I can’t see any reason why that time is now. Good work is being done now in Second Life, and this will continue into the future. However, as well as pointing out the hassle for educators in getting ports opened, Alan is right to demand evidence that Second Life is a pedagogically useful and cost-effective educational tool. But I firmly believe this evidence is being generated. 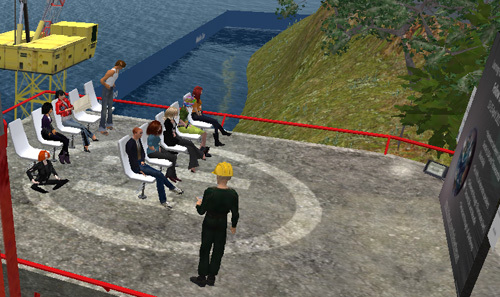 The groups of students in our research projects do report genuine benefit from using Second Life. The students in Luke’s and Michael’s cohorts reported the same. Similarly, Luke was involved in the development of the PIVOTE system with Daden. We intend to use PIVOTE in SWIFT, and, as it is open source, the only cost will be my time and Paul’s. And I know it will be a very useful tool. Set-up costs exist in any endeavour, but how many follow this with free unrestricted access, free artefacts and open-source software? These are pretty good reasons for staying. Like other institutions, the University of Leicester is undertaking exacting and exciting research in Second Life that I’m certain will lead to its evidence-based, widespread application in teaching and learning. Sandra’s CALF project already is throwing some light on this possible learning future. The only question I can’t answer is how long this will take, but I hope you’ll follow our journey on the Second Life Twitter tag #UoLinSL. Or better still, come and visit us in our new physical Media Zoo, and we can show you what we mean. Following Simon’s recent blog about the oil rig task that is currently being produced for the Occupational Psychology team, I have been thinking about how we will measure the potential benefits for the students, and how we might expect this SL-tivity to impact the learning experiences of the students on our MSc courses. 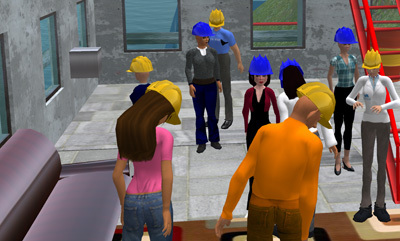 Because of the specific nature of the oil rig task, not all students on the course will be required to use Second Life to complete the unit assignment for this module, which means that it will be possible to conduct a between-subjects comparison: How does the learning experience of students using Second Life differ to the learning experiences of those who are not using Second Life? One way of exploring this will be through interviewing the students, asking them to evaluate their experiences. A more indirect measure might involve looking at students’ performance against particular learning outcomes (for example, perhaps looking at whether Second Life usage is related to better marks in this unit assignment). While I was thinking about this, I came across an interesting case study from the Loyalist College in Canada. The task has been created for Customs and Immigrations students who are training to become guards on the US-Canadian border. Because of changes to security regulations after September 11, students were no longer able to train with actual border guards. Therefore, a virtual border crossing simulation was created in Second Life. Since the simulation was created, students’ scores on critical skills tests were reported to have increased from 56% success in 2007 to 95% by the end of 2008. 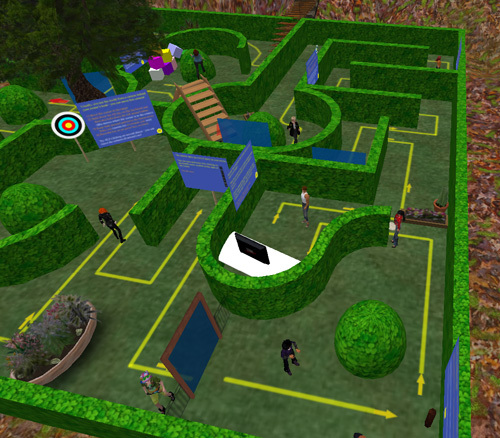 In addition to this, increased numbers of students and faculty staff were reported to have explored Second Life for “mixed purposes” since the simulation was implemented. Further to my blog post of 22 June, Matt and I have been developing the wonderful oil rig donated to the Duckling project by Sky Maruti. 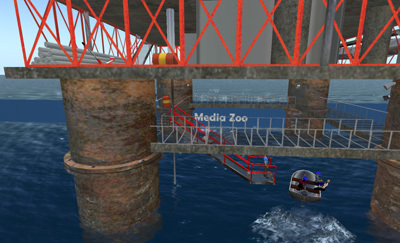 The first priority was to find a suitable spot on the Media Zoo island for the rig. We wanted it in the lagoon, but didn’t need it to overpower the other structure there, the boat house. Using the island owner’s avatar, I set about flattening the land on the peninsula, both above water and below. This opened up a sizable area of the lagoon, into which we placed the oil rig. Because it is a single (linked) artefact, I was able to place the structure precisely so that the bottom access platform just touched the water (this is where the evacuation rescue boat will dock), while the rear of the rig abutted the edge of the island. Inside the housing areas of the rig, we are in the process of adding floors, extra stairwells, equipment, and so forth. At present, we are only doing the obvious builds. The occupational psychologists on Duckling will need to become familiar with the layout of the rig, and then sit down with us to work through the redesign. In the meantime, though, I am searching X Street SL for artefacts to place on the rig. Some of these will need to be utilised for the altered environmental conditions that will necessitate the evacuation, so realism is important (an electrical fire needs to be caused by an electrical device such as a PC). Once we have completed the new layout and placed the artefacts in suitable positions – and sourced a rescue boat! – the occupational psychologists can begin to finalise their SL-tivities. Several weeks ago – and as part of Duckling – a Zookeeper, a learning technologist, a learning designer, an e-learning researcher and a smattering of occupational psychologists met to discuss the ways in which the latter could introduce Second Life into some of their online activities (SL-tivities) for distance learning students. Most of the ideas from the psychologists were terrific. My favourite was to construct a localised rail service that could be manipulated to introduce delays, accidents, etc., and ask the students to react accordingly. Another involved evacuation procedures for a burning submarine. Fantastic! What I liked about these suggestions was the fact that everyone was thinking in terms of the unique benefits of the virtual world: do in Second Life what cannot be achieved in real life – or only with immense technical difficulty or cost. Practically, in terms of time and SL programming skills, the railway was not possible; however, generating evacuation procedures were. Thinking a submarine might be quite hard to locate, we talked a little about other possible structures and came up with an oil rig. A quick search on X Street found an ideal structure, built by a talented SL designer named Sky Maruti. I contacted Sky and arranged to have my avatar, Johnson Zuta, walk around the rig the following day. The oil rig seemed ideal, especially as it came with copy/modify rights. Matt and I could adapt it with extra stairwells, and add smoke and such as requested by the psychologists. We could also use variations of the rig for future projects. My first foray into virtual real estate has been fun, from generating the initial idea to locating and acquiring the SL artefact. And I’ve made contact with a talented SL designer, who we may be able to use in the future. I look forward to adapting the oil rig and observing the SL-tivities. I’ll blog about both of these events in due course.